Innovatiecluster Drachten (ICD) is a group of first-rate, high-tech manufacturing companies unique in Northwestern Europe. We work together with leading knowledge institutions, what's making us leaders of innovation. We are competitive on the global market and realize solutions for the big challenges of the future: the Big 5 of High Tech. Our collaboration results in more than 50 new product introductions a year worldwide that save people’s lives, render the control of complex systems easy, adjust products to the individual needs and wishes of consumers, and make data needed for further improvement of food quality accessible. 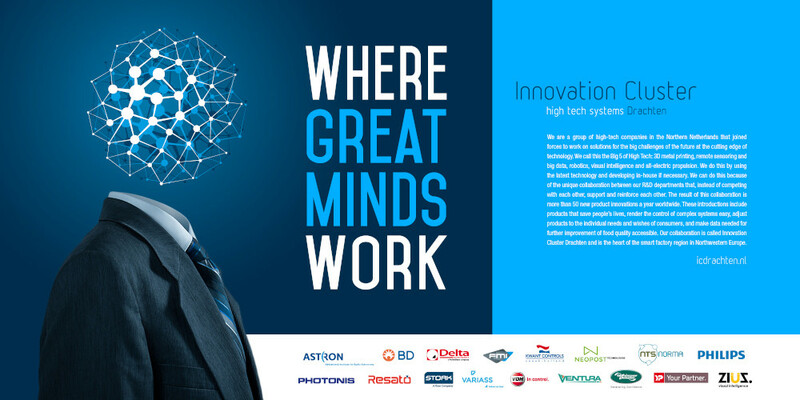 Together the ICD companies are the heart of the smart factory region in Northwestern Europe. Knowledge institutes like the universities of Groningen and Twente, universities of applied science like NHL/Stenden and Hanze University, and regional training center ROC Friese Poort have linked up with us. Join us if you like challenging technical solutions and would like to contribute to the development and production of innovative, high-end and unique products. We are attractive to students who want to develop a future-oriented career in high-tech industry. Working with us means contributing to solutions for the future. Over 3,800 motivated professionals - from university graduates to production employees - opted allready for a career in high-tech industry at one of our companies. We offer you to graduate and do internships in a high-grade technological environment. We also offer facility-share programs, and special talent and career development programs for senior secondary vocational education and training (VET) and university students and graduates. And when you are ready, we will also help you with your own company start-up. You see, for starting talent and experienced professionals we offer opportunities to develop a future-oriented career in high-tech industry at companies that are ahead of their competitors!